Webility serves as a catalyst for positive change in absence management, workers’ compensation & disability benefits programs & systems. Since our founding in 1999, our small firm has been drawing attention to a hole in the social fabric of North America that creates needless impairment, work absence, job loss, and withdrawal from the workforce among people who are dealing with health conditions. 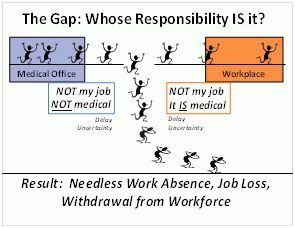 Our focus is the gap between the doctor’s office and the workplace. We help others see how that gap is now harming vulnerable people and wasting resources. Our goal is to get people the support they need to remain functional, independent, and able to participate fully in human life, which usually includes work. We have been helping doctors, employers, benefits payers and other stakeholders across North America develop a shared vision of what needs to happen in these situations, then establish collaborative working relationships and adopt better communications methods. We have become unofficial translators and envoys between professions, stakeholder groups, and sectors of the economy. We count some of the largest employers, insurers, and government agencies in the USA among our clients. We are known as thought-leaders, change agents and innovators, altering the way people see things, offering new paradigms and conceptual models. We teach people how to apply these new ideas in their own organizations. We study both front-line and system-wide processes in detail to find ways to improve them, recommend or invent new ways of doing things, develop new products and services, and when needed, pilot test them.